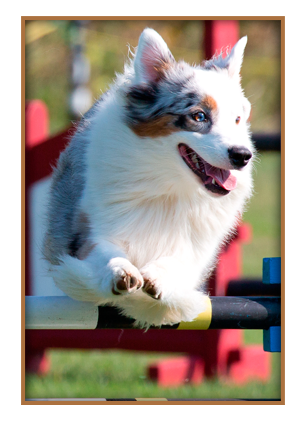 Maplewood is now offering Agility classes for all levels. Michele has been involved in dog training for the last 15 years. First in Obedience with her Golden Retrievers, then she discovered Agility and fell in love with the sport. She's been actively competing in Agility for the last six years. Michele also works her dogs in harness in the Fall and Winter months when she participates in various dog sledding events with her six Australian Shepherds. Prerequisites: This class is open to puppies 6 months and up and well socialized dogs. Knowledge of basic obedience skills such as come, sit, down and stay are required. Next session: Please contact us for more information. Prerequisites: Completion of Beginners Level 1 or the equivalent. Prerequisites: Completion of Beginners Level 2 or the equivalent. Dogs: Dogs must be 18 months or older; well socialized; have kowledge of basic obedience (come, sit, down, stay); and knowledge of all agility equipment. Handlers: Knowledge of basic handling skills. Starters Class: Competition level sequences are introduced. Advanced Class: Advanced level sequences are introduced. 1. Group Lessons (maximum 4 dogs): $160 for 8 weeks, HST included. Payment is due on the first day of the session. 2. Private lessons: $35 an hour, HST included. Payment is due on day of lesson. 3. Train and Board: Add $10 per dog to your daily boarding fee. Michele will work with your dog on a daily basis, teaching new skills or improving existing skills. Payment is due at the end of the dogs stay. For further details and to register for one of our classes, please contact Michele at: 613-774-0128 or email: info@dogretreat.ca.